Halonium ions used in this study, are well-known reaction intermediates and halogenating reagents in synthesis, but now they have been used as robust and stable structural units in molecular nanotechnology. Academy Professor Kari Rissanen and Dr. Lotta Turunen at the University of Jyväskylä together with research groups from Freie Universität Berlin, Germany, Professor Christoph A. Schalley and M.Sc. Ulrike Warzok, have published a study on a new nano-sized hexameric molecular capsule based on a completely new concept. Construction of nano-sized structures by exploiting non-covalent interactions has received considerable attention due to their potential applications in molecular nanotechnology. 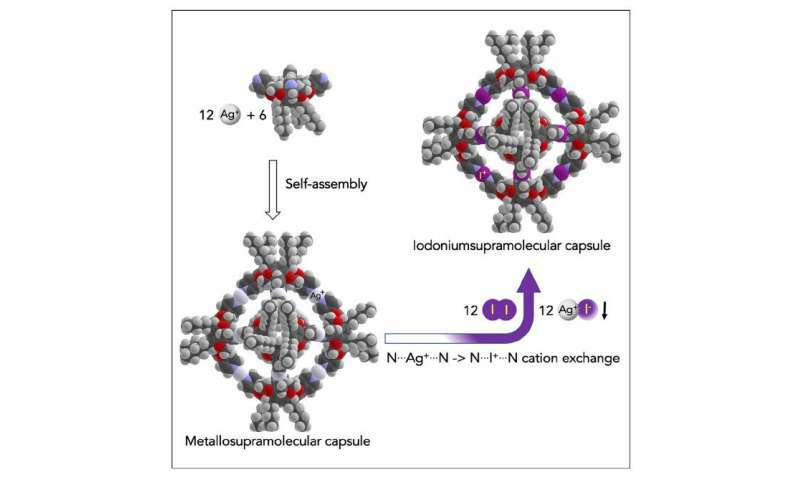 Gigantic > 4 nm nanospheres have been constructed using the metal-ligand coordination bond, while smaller supramolecular capsules have been obtained mainly via hydrogen bonding. Halonium ions used in this study, are well-known reaction intermediates and halogenating reagents in synthesis, but now they have been used as robust and stable structural units in molecular nanotechnology. It is not easy to synthesize capsules. The present work presents a procedure where a carefully designed molecule is first assembled to a hollow nano-sized capsule through 12 silver ions. Using a simple cation-exchange reaction, the 12 silver ions are exchanged to 12 iodonium ions resulting in a halogen-bonded capsule with 4.5 nm diameter. These results create a basis of halonium ion-based nanotechnology allowing the construction of structurally precise and robust gigantic nanomolecules.